We’re in the dog days of summer, and while school starts soon in some locations, others plan to vacation in August due to lower rates at certain resorts and locales. In any case, traveling is a challenge whether you or your loved ones have physical, mental or other special needs. FirstLight Home Care offers needed solutions to your travel concerns. 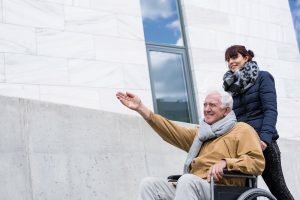 If someone you care for has special needs, mobility or other travel obstacles to overcome, FirstLight Home Care offers assistance with an option called the Travel Companion Services Program. A FirstLight Travel Companion can be engaged to help with almost any travel issue, from navigating through the airport, to arranging ground transportation, wheelchair use, and getting through security to assisting with luggage, food and bathroom needs. Maybe you need to fly your elderly mother to visit you or the grandkids from a distant location, and you cannot be there to help. A Travel Companion can pick her up at home, help her with transportation, assist her as needed to get her through the airport, security and to the right gate at the right time! You may not be able to be there, but you can have peace of mind that she is being cared for by an experienced and caring professional. If you are afraid your senior or adult loved one cannot travel due to special needs, consider contacting our “Just Ask FirstLight” service today for more information! Travel desires need not be limited due to concerns about mobility, transportation, personal care or other issues. Find out about our certified travel companion services.